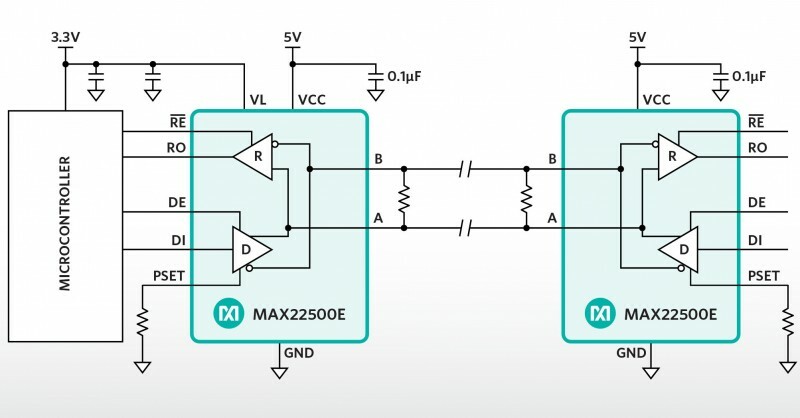 Maxim Integrated Products has announced the MAX22500E, MAX22501E and MAX22502, a set of RS-485 transceivers that enable Industrial designers to achieve 2x faster data rates and extend cable length by up to 50%. With motion control systems requiring more accuracy over longer distances, system designers are challenged to maintain faster data rates and achieve robust communications with longer cables. A production site, for example, may not efficiently function with a slow data rate and short cables as it must transfer accurate information quickly and over a long distance. 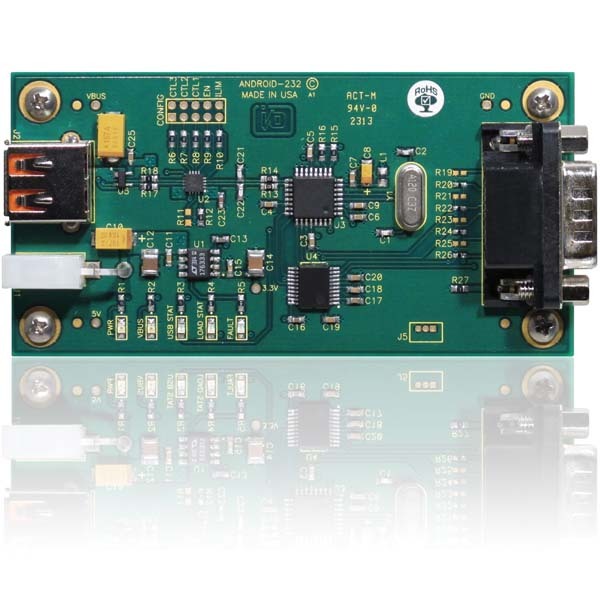 The MAX22500E/MAX22501E (half-duplex) and MAX22502E (full-duplex) ESD-protected RS-485/RS-422 transceivers extend the reach of communication up to 100 Mbps over 50 m. This provides the industry’s fastest data rates for accurate, cost-effective, and robust communication across long cables for a variety of motion control applications. The settable pre-emphasis feature within the MAX22500E and MAX22502E enables 2x faster data rates compared to competitive solutions for increased encoder resolution and reduced latency. Pre-emphasis extends cables up to 50% longer to communicate over longer distances. A large receiver hysteresis (250 mV) provides superior robustness to EFT. 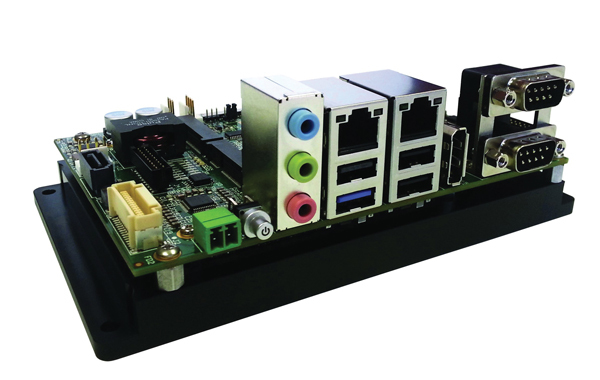 In addition, by improving the signal integrity and robustness, system designers can achieve the same level of performance with lower-cost cables. The transceivers operate over the -40℃ to +125℃ temperature range. Traditional RS-232 communication needs one transmit line (TXD or TX), one receive line (RXD or RX), and a Ground return line. 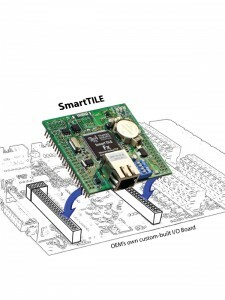 The setup allows a full-duplex communication. However, many applications use only half-duplex transmissions, as protocols often rely on a transmit/acknowledge scheme. With a simple circuit like Figure 1, this is achieved using only two wires (including Ground). This circuit is designed to work with a “real” RS-232 interface (i.e., using positive voltage for logic 0s and negative voltage for logic 1s), but by reversing the diodes it also works on TTL-based serial interfaces often used in microcontroller designs (where 0 V = logic 0; 5 V = logic 1). The circuit needs no additional voltage supply, no external power, and no auxiliary voltages from other RS-232 pins (RTS/CTS or DTR/DSR). Although not obvious at a first glance, the diodes and resistors form a logic AND gate equivalent to the one in Figure 2 with the output connected to both receiver inputs. The default (idle) output is logic 1 (negative voltage) so the gate’s output follows the level of the active transmitter. The idle transmitter also provides the negative auxiliary voltage –U in Figure 2. 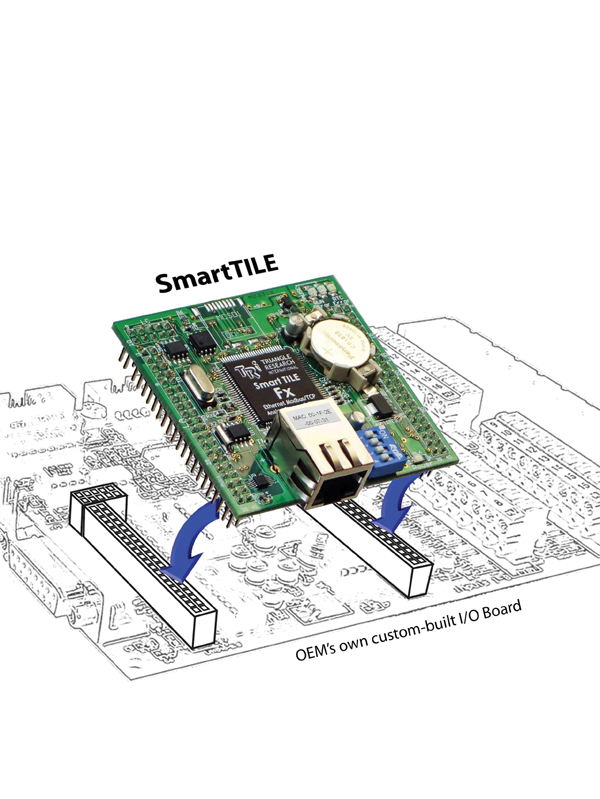 Because both receivers are connected to one line, this circuit generates a local echo of the transmitted characters into the sender’s receiver section. 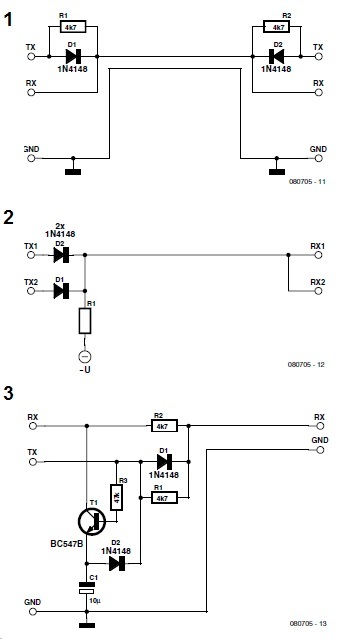 If this is not acceptable, a more complex circuit like the one shown in Figure 3 is needed (only one side shown). This circuit needs no additional voltage supply either. In this circuit the transmitter pulls its associated receiver to logic 1 (i.e., negative voltage) by a transistor (any standard NPN type) when actively sending a logic 0 (i.e., positive voltage) but keeps the receiver “open” for the other transmitter when idle (logic 1). Here a negative auxiliary voltage is necessary which is generated by D2 and C1. Due to the start bit of serial transmissions, the transmission line is at logic 1 for at least one bit period per character. The output impedance of most common RS-232 drivers is sufficient to keep the voltage at C1 at the necessary level. Note: Some RS-232 converters have quite low input impedance; the values shown for the resistors should work in the majority of cases, but adjustments may be necessary. In case of extremely low input impedance, the receiving input of the sender may show large voltage variations between 1s and 0s. As long as the voltage is below –3 V at any time these variations may be ignore.— Andreas Grün, “One Wire RS-232 Half Duplex,” Elektor July/August 2009. Maurizio Di Paolo Emilio, who has a PhD in Physics, is an Italian telecommunications engineer who works mainly as a software developer with a focus on data acquisition systems. Emilio has authored articles about electronic designs, data acquisition systems, power supplies, and photovoltaic systems. 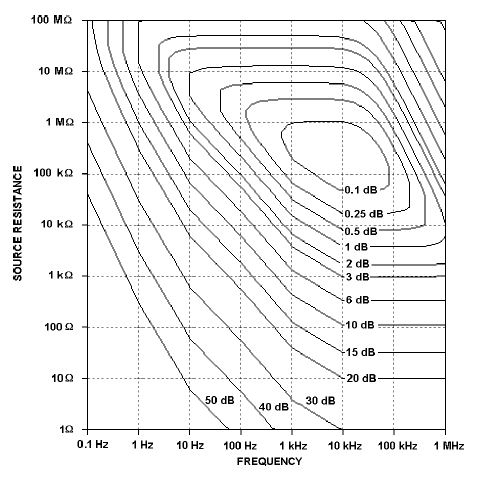 In this article, he provides an overview of what is generally available in low-noise amplifiers (LNAs) and some of the applications. An LNA, or preamplifier, is an electronic amplifier used to amplify sometimes very weak signals. To minimize signal power loss, it is usually located close to the signal source (antenna or sensor). 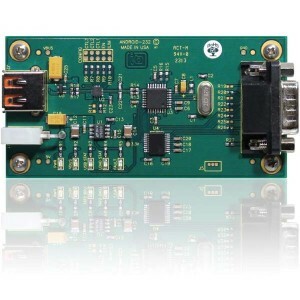 An LNA is ideal for many applications including low-temperature measurements, optical detection, and audio engineering. 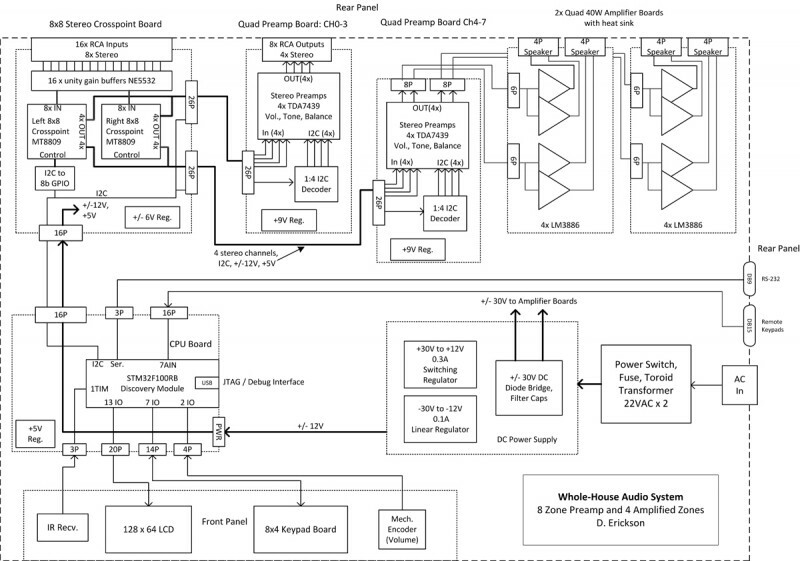 This article presents LNA systems and ICs. Feedback amplifiers combine the output and input so a negative feedback opposes the original signal (see Figure 1). Feedback in amplifiers provides better performance. In particular, it increases amplification stability, reduces distortion, and increases the amplifier’s bandwidth. 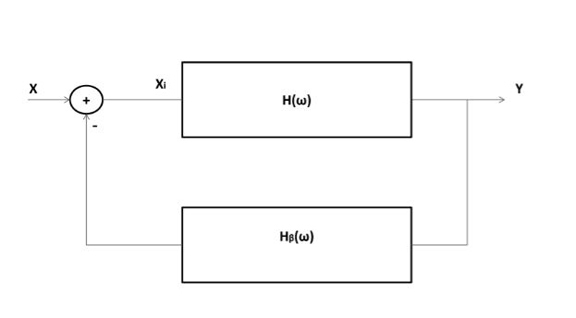 Figure 1: A feedback amplifier model is shown. A preamplifier amplifies an analog signal, generally in the stage that precedes a higher-power amplifier. Both the Linear Technology and Analog Devices amplifiers have voltage noise density at 1 kHz at around 1 nV/√Hz and also offer excellent DC precision. Texas Instruments (TI) offers some very low-noise amplifiers. They include the OPA211, which has 1.1 nV/√Hz noise density at a 3.6 mA from 5 V supply current and the LME49990, which has very low distortion. 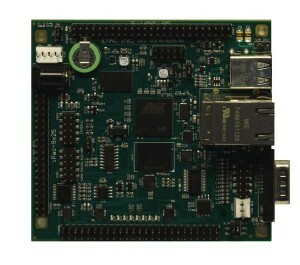 Maxim Integrated offers the MAX9632 with noise below 1nV/√Hz. The op-amp can be realized with a bipolar junction transistor (BJT), as in the case of the LT1128, or a MOSFET, which works at higher frequencies and with a higher input impedance and a lower energy consumption. The differential structure is used in applications where it is necessary to eliminate the undesired common components to the two inputs. Because of this, low-frequency and DC common-mode signals (e.g., thermal drift) are eliminated at the output. A differential gain can be defined as (Ad = A2 – A1) and a common-mode gain can be defined as (Ac = A1 + A2 = 2). An important parameter is the common-mode rejection ratio (CMRR), which is the ratio of common-mode gain to the differential-mode gain. This parameter is used to measure the differential amplifier’s performance. Figure 2: The design of a simple preamplifier is shown. Its main components are the Linear Technology LT1128 and the Interfet IF3602 junction field-effect transistor (JFET). 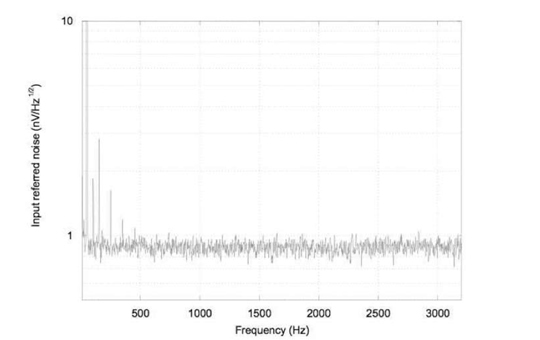 Figure 2 shows a simple preamplifier’s design with 0.8 nV/√Hz at 1 kHz background noise. Its main components are the LT1128 and the Interfet IF3602 junction field-effect transistor (JFET). 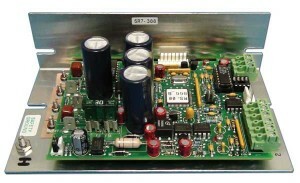 The IF3602 is a dual N–channel JFET used as stage for the op-amp’s input. 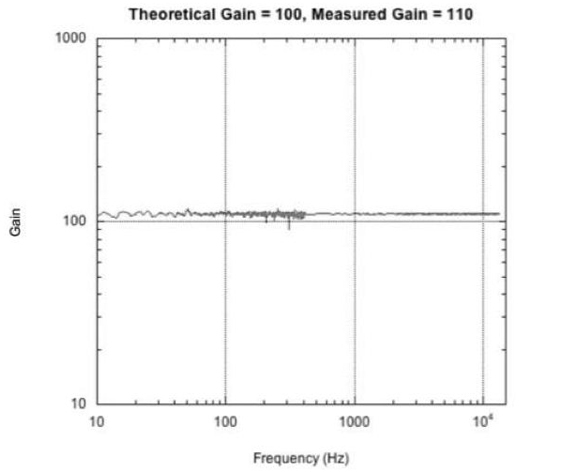 Figure 3 shows the gain and Figure 4 shows the noise response. Figure 3: The is a low-noise preamplifier’s gain. Figure 4: A low-noise preamplifier’s noise response is shown. 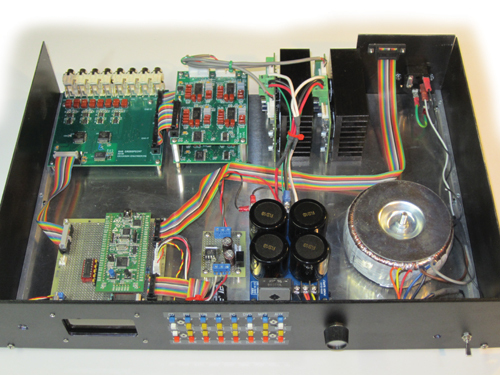 The Stanford Research Systems SR560 low-noise voltage preamplifier has a differential front end with 4nV/√Hz input noise and a 100-MΩ input impedance (see Photo 1a). 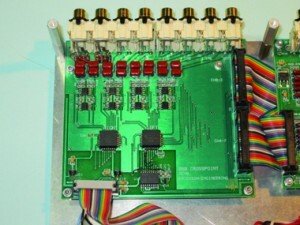 Input offset nulling is accomplished by a front-panel potentiometer, which is accessible with a small screwdriver. 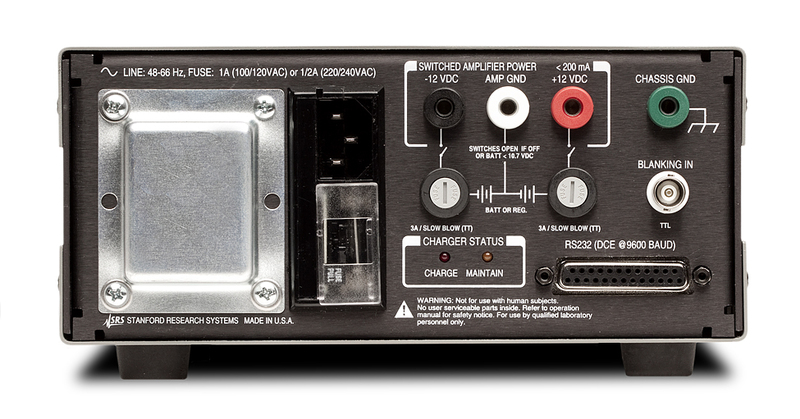 In addition to the signal inputs, a rear-panel TTL blanking input enables you to quickly turn the instrument’s gain on and off (see Photo 1b). 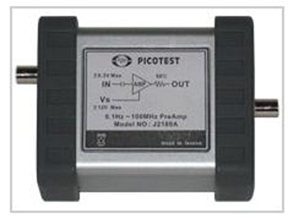 The Picotest J2180A low-noise preamplifier provides a fixed 20-dB gain while converting a 1-MΩ input impedance to a 50-Ω output impedance and 0.1-Hz to 100-MHz bandwidth (see Photo 2). 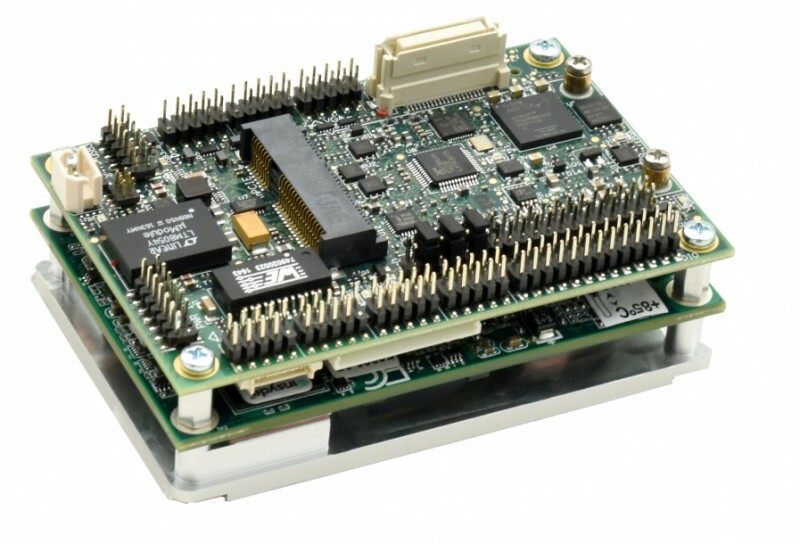 The preamplifier is used to improve the sensitivity of oscilloscopes, network analyzers, and spectrum analyzers while reducing the effective noise floor and spurious response. 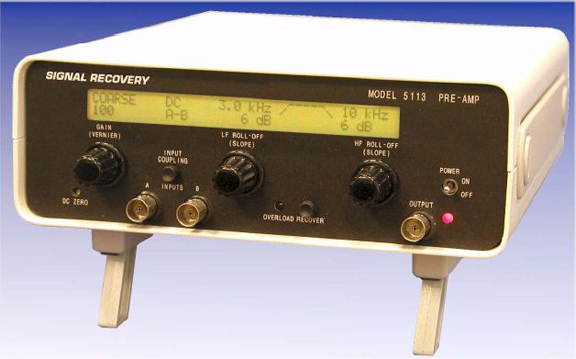 The 5113 (see Photo 3 and Figure 5) is used in applications as diverse as radio astronomy, audiometry, test and measurement, process control, and general-purpose signal amplification. It’s also ideally suited to work with a range of lock-in amplifiers. Figure 5: Noise contour figures are shown for the Signal Recovery Model 5113. This article briefly introduced low-noise amplifiers, in particular IC system designs utilized in simple or more complex systems such as the Signal Recovery Model 5113, which is a classic amplifier able to obtain different frequency bands with relative gain. 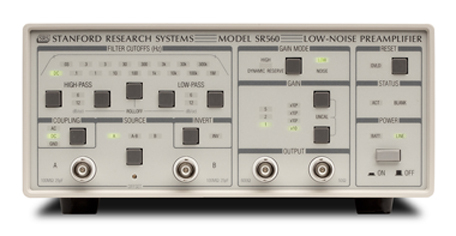 A similar device is the SR560, which is a high-performance, low-noise preamplifier that is ideal for a wide variety of applications including low-temperature measurements, optical detection, and audio engineering. Moreover, the Krohn-Hite custom Models 7000 and 7008 low-noise differential preamplifiers provide a high gain amplification to 1 MHz with an AC output derived from a very-low-noise FET instrumentation amplifier. One common LNA amplifier is a satellite communications system. The ground station receiving antenna will connect to an LNA, which is needed because the received signal is weak. The received signal is usually a little above background noise. Satellites have limited power, so they use low-power transmitters.